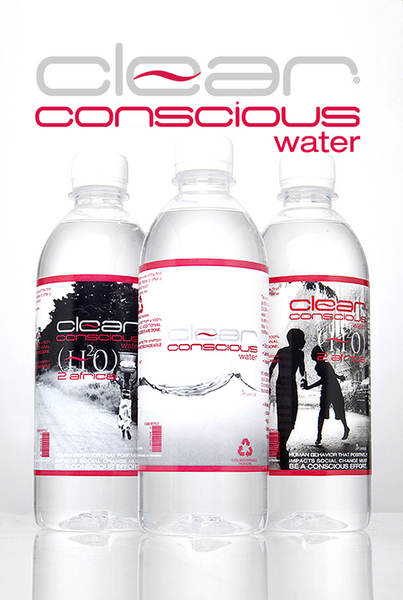 Clear Conscious Water is a Bottled Spring Water Company that is a worldwide distributor of 100% Natural bottled spring water. Our spring water has a perfect PH level of 7.0 neutral. The purity is equal to distilled water. Clear Conscious Water is the first green Spring Water Company in the United States. Our water is bottled in 100% Biodegradable packaging that completely degrades in landfills within 280 days.when consumers purchase our earth freindly product In addition to enjoying 100% Natural Spring Water, the consumer will help save our planet by leaving a 0 carbon footprint by reducing landfill waste. Clear Conscious Water is a socially aware company. To help eradicate the world's drinking water problems Clear Conscious Water provides aid to Africa and other developing countries that lack access to safe clean drinking water. A five percent dividend of product sales or the equivalent in Clear Conscious Water will be donated to help people around the world who do not have access to clean drinking water. Clear Conscious Water will be sold at Wall-Mart, Target, Cosco's GNC and WholeFoods stores and supermarkets in the United States. International markets include Dubai Saudi Arabia. China and India. Howard Smith has created several businesses as an independent owner. Mr. Smith has applied the experience of training, marketing, and operations to the inception and operation of Clear Conscious Water. This experience directly enhances Clear Conscious Water operations, strategic positioning, and market share. Angela Lockhart has worked for several S&P 500 companies during her career, using her knowledge of marketing, operations, and market branding and insertion to succeed in each position. Because of her talented management style, and interest in working hands-on within a company, Ms. Lockhart has been invited to join the Clear Conscious Water management team. Her responsibilities will consist of product placement and consumer interaction. She is also responsible for implementing the company's marketing plan which will build the company's brand and distribution base quickly. Delmond Newton is the President and CEO of Fever Beverage Company. Mr. Newton will work with Ms. Lockhart regarding the company’s US. and international marketing, distribution and brand recognition process. Fever is a natural, non-carbonated stimulation beverage. Fever Stimulation Beverage has announced a distribution deal with General Nutrition Centers. Under the pact, Fever Beverages are currently available in more than 1,000 GNC stores across the US; Fever is distributed thru Wal-Mart and other major distributors.